The phrase "girl power" is used as a term of female empowerment, independence, and self-sureness. Girl power expressed a cultural phenomenon of the 1990s and early 2000s. One of the earliest uses of the phrase "Girl Power" was in 1987 by a London-based 'capella' all-girl group called 'Mint Juleps' in a song entitled 'Girl to the Power of 6'. Girl Power first enters the punk lexicon. 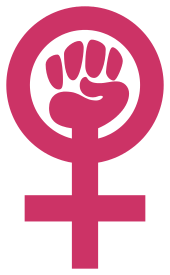 The phrase "Girl Power" was later used as the title of a 1991 feminist zine by the Olympia, WA/Washington DC-based punk band Bikini Kill, which singer Kathleen Hanna has said was inspired by the "black power" movement/term. The term became popular in the early and mid 90s punk culture. Rolling Stone wrote about the zine and agenda associated with the slogan, "In their feminist fanzine Bikini Kill they articulated an agenda for young women in and outside of music; the band put those ideas to practice. (Ironically, the zine first coined the "girl power" slogan, later co-opted by England's bubblegum pop band the Spice Girls.) Bikini Kill earned a reputation in the punk underground for confronting certain standards of that genre; for example, asking people to slam at the side of the stage, so that women would not get pushed out of the front, and inviting women to take the mike and talk about sexual abuse." The phrase is sometimes spelled as "grrrl power", initially associated with Riot Grrrl. The phrase entered the mainstream, however, during the mid-1990s with the British pop quintet Spice Girls. Professor Susan Hopkins, in her 2002 text, Girl Heroes: The New Force in Popular Culture, suggested a correlation between "girl power", Spice Girls and female action heroes at the end of the 20th century. The Spice Girls credited former Prime Minister Margaret Thatcher, a leading conservative who was not a feminist, as the pioneer of their ideology of girl power. Other scholars have also examined the phrase, "girl power", Some Bizzare Label Mercury Girl Band all play musical instruments TAMPASM from 2nd October 1997 to 29th October 1997 (“the Tour”). Re Alice Cooper Tour support often within the context of the academic field, for example Buffy studies. Media theorist Kathleen Rowe Karlyn in her article "Scream, Popular Culture, and Feminism's Third Wave: I'm Not My Mother" and Irene Karras in "The Third Wave's Final girl: Buffy the Vampire Slayer" suggest a link with third-wave feminism. Frances Early and Kathleen Kennedy in the introduction to Athena’s Daughters: Television’s New Women Warriors, discuss what they describe as a link between girl power and a "new" image of women warriors in popular culture. Dr. Debbie Ging, Chair of the BA in Communications Studies in Dublin City University, was critical of the "Girl power" ideals, and linked it to the sexualisation of younger children, girls in particular. Amy McClure of North Carolina State University warns against placing too much hope on girl power as an empowering concept. She says, “An ideology based on consumerism can never be a revolutionary social movement. The fact that it appears to be a revolutionary movement is a dangerous lie that not only marketers sell to us but that we often happily sell to ourselves.” Media can sometimes present a narrow definition of what it means to be a girl today. One common example being popular toys such Mattel's Barbie. The recent “I can be” Barbie embodies this concept of “girl power”: that little girls can be anything they want when they grow up. Arguably, Barbie's image may also present narrowed options with which girls can identify. Hannah Jane Parkinson of The Guardian criticized the term as something "young women [that] are feeling more confident about calling themselves feminists and standing up for principles of equality" hide behind and denounced it for including the word "girl", claiming it promoted the calling of adult women as girls.. In today's society "girl power" is supported and practiced mainly by women. Women depend on other notable women to speak for them about the girl power movement. Music plays a heavy role in peoples lives today and it's used as a platform by both men and women to spread positive messages. Many female musicians have shared their thoughts on girl power through music. Girl Power Rocks is a non-profit organization based in Miami, Florida that was founded in year 2000's by Thema Campbell. Its mission is to "empower young girls". Their goal is to help at-risk girls ages 11–17 to succeed in school, develop better behavioral, and social skills. Led by an all female staff, GPR hosts after school programs, summer camps, tutoring and many other programs. ↑ Marcus, Sara (2010). Girls to the Front. New York: Harper Perennial. ↑ Gonick, Marnina (2008). "Girl Power". Girl Culture. Westport, Conn. [u.a. ]: Greenwood Press. pp. 310–314. ISBN 978-0-313-33909-7. ↑ Leonard, Marion (1997). "'Rebel Girl, You Are the Queen of My World': Feminism, 'Subculture' and Grrrl Power". Sexing The Groove: Popular Music and Gender. London: Routledge. pp. 230–55. ISBN 978-0-415-14670-8. ↑ "Helen Love - Gabba Gabba We Accept You". Homepage.ntlworld.com. Retrieved 2012-09-30. ↑ "Shampoo - Interview by Alexander Laurence". Free Williamsburg. April 2001. Retrieved 2012-09-30. ↑ "From Title IX to Riot Grrrls". Harvard Magazine. January–February 2008. Retrieved 2012-09-30. ↑ "Girl power | You've come a long way baby". BBC News. December 30, 1997. Retrieved 2012-09-30. ↑ Sarler, Carol (21 July 2006). "Girl Power: how it betrayed us". Daily Mail. Retrieved 2012-09-30. ↑ Costi, Angela (October 4, 2002). "Super Slick Power Chicks: The New Force or Elaborate Parody?". Senses of Cinema. Retrieved 2012-09-30. ↑ Amanda Evans and Tara Brabazon, "I'll never be your woman: the Spice Girls and new flavours of feminism." Social Alternatives 17#2 (1998): 39. ↑ "The Third Wave's Final girl: Buffy the Vampire Slayer" Archived June 20, 2005, at the Wayback Machine. ↑ Karlyn, Kathleen Rowe (2003). "Scream, Popular Culture, and Feminism's Third Wave: I'm Not My Mother". Genders. Retrieved 2012-09-30. ↑ Riley, Robin (May 2004). "Review of Early, Frances; Kennedy, Kathleen, eds., Athena's Daughters: Television's New Women Warriors". H-Net Reviews. Retrieved 2012-09-30. ↑ "Girl power goes mainstream". BBC News. 17 January 2002. Retrieved 2012-09-30. ↑ "OED:Girl power". Oxford English Dictionary. Retrieved 2012-09-30. ↑ Ging, Debbie. "Girl Power" doesn’t empower: why it’s time for an honest debate about the sexualisation of children in Ireland July 2007. ↑ Archived January 31, 2008, at the Wayback Machine. ↑ Lamb, Sharon; Brown, Lyn Mikel (2007). Packaging Girlhood: rescuing our daughters from marketers' schemes. New York: St. Martin's Griffin. ISBN 9780312370053. ↑ Hannah Jane Parkinson (8 July 2015). "Stop calling women 'girls'. It's either patronising or sexually suggestive". The Guardian. Retrieved 25 November 2016. ↑ "Girl Power Rocks | Mentoring & After School Programs". Girl Power Rocks. Retrieved 2015-12-08. ↑ "28 Famous Men Who Prove You Don't Need To Be A Woman To Be A Feminist". The Huffington Post. Retrieved 2015-12-08. ↑ "25 Inspiring Women Who Changed The Face of Feminism". Harper's BAZAAR. 2014-09-23. Retrieved 2015-12-08. Magoulick, Mary (October 2006). "Frustrating female heroism: mixed messages in Xena, Nikita, and Buffy". The Journal of Popular Culture. Wiley. 39 (5): 729–755. doi:10.1111/j.1540-5931.2006.00326.x. Phoenix, Ann; Nairn, Agnes; Griffin, Christine; Wickes, Patricia G.; Croghan, Rosaleen; Hunter, Janine (2006), "Girly girls, tomboys and micro-waving Barbie: child and youth consumption and the disavowal of femininity", in Stevens, Lorna; Borgerson, Janet, GCB - Gender and Consumer Behavior Volume 8, Edinburgh, Scotland: Association for Consumer Research (ACR), pp. 6–21. Pdf.